Being a developer isn’t the easiest of job. But every job has its own challenges. As technology is changing overnight it is quite difficult to keep abreast with all the changes and modifications. Developers need to be on their toes every time as it is the foremost part of their work to be informed about all the transitions in developing sector. Developers may be of different types but Java being one of the most popular programming language there are so many Java developers who are available in the developers industry. However with hoard of Java developers being the best doesn’t come easily. 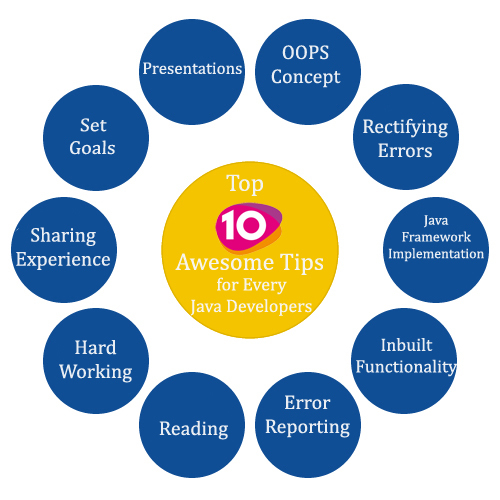 There some important points which needs to be followed to become an awesome Java Developer. Clarity of OOPS Concept: Having a strong base for any business is very essential. Basic knowledge allows you to deal with tough circumstances easily. Object oriented programming better known as OOPS is must to be a good Java developer. Having proper knowledge about OOPS ensures in proper designing and solutions for customers. Rectifying Errors: Writing codes with efficiency is a sign of a good developer. Code writing is a time consuming job which requires utmost concentration as a single error in writing code can ruin your several days of work. Apart from writing codes properly it is also necessary to locate those erred codes and re-write them properly. Java Framework Implementation: Having Java knowledge and implementing them are two different things. It is necessary for developer to know how to implement Java framework while developing software or an application. Writing codes in simpler way can really help the end user and also the maintenance of the software or the app can do easily. Inbuilt Functionality: Apart from having knowledge of Java there is a certain need of having advanced knowledge about the inbuilt functionalities such as SCRUM, XP, waterfall etc. Java software Development Company looks for such developers who have vast knowledge in programming languages and tools. Error Reporting: A good developer will always develop Software or an app which can detect errors and send reports to the customer support. This feature enables the customer support team to take charge and clear that error in an effective manner. Reading: There is a reason behind phrase that “Books are men best friend”. A good developer will always have proper study material whether books or blogs from where he can be informed about the changes in this industry. Practice makes the man perfect: There is no shame in practicing the art of writing codes and using programming tools again and again in order to become perfect. A good developer will never shy from learning as well as teaching. Sharing Experience: Bad experience for one can be fruitful for other. One can really avoid doing things which he learnt over a period of time by listening to other experiences. It’s a trait of a good developer to take others experiences into account before applying your mind in some development. Set Goals: Working without having any goal is like wondering without knowing where to go. A brilliant developer will never waste his time on a job where he feels the scope of scalability is less, however changing of jobs on short terms will not give good impression to Java Software Development Company, therefore it is important to find job which helps in reaching your goals in faster way rather than crawling towards it. Presentations: Giving an attractive presentation is quite necessary whenever you approach any Java software Development Company as it will show your competency as a developer and will give good impressions to the recruiters.